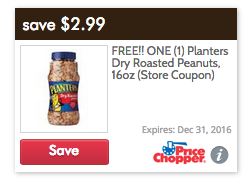 Price Chopper: FREE Planters Peanuts 16 oz.! Score a FREE Planters Dry Roasted eanuts 16 oz. w/ this weeks Festive Friday ecoupon! Search "planters" to easily locate the coupon.